Church members listen to a sermon in their church, its roof destroyed by bombing, near Wonsan, northern Korea, in November 1950. This was during the period when the UN forces had expanded into the north and temporarily reclaimed this area. 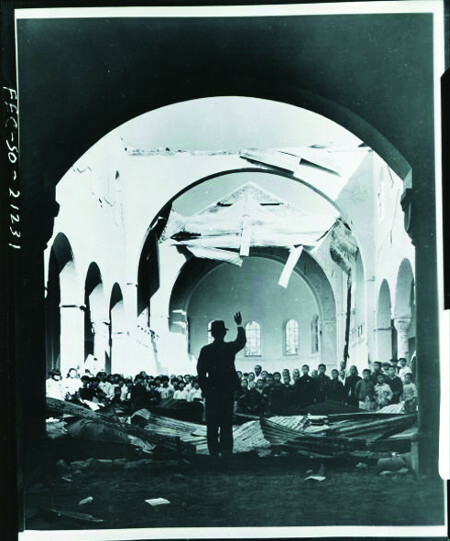 The Institute for Military History said about the photo, “It appears to be northern Christians, who had been persecuted, holding a worship service to welcome and thank the just-arrived UN troops.” Because there were good persons praying to God even amidst the ruins, we have been able to receive the legacy of faith. Among the 140 U.S. military chaplains involved in the Korean War, 13 were killed in the line of duty and 26 were wounded. “The Korean War was an ideological war. 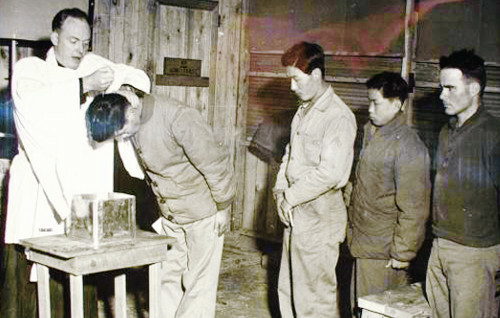 The communist nations treated human life lightly, and oppressed religious and spiritual culture. On the other hand, liberal nations endeavored to protect these,” Maj. Nam said. From 2012~2013, Nam worked as a dispatched researcher at the U.S. National Archives and Records Administration, and as an exchange researcher at the U.S. Army Research Institute. U.S. native Rev. 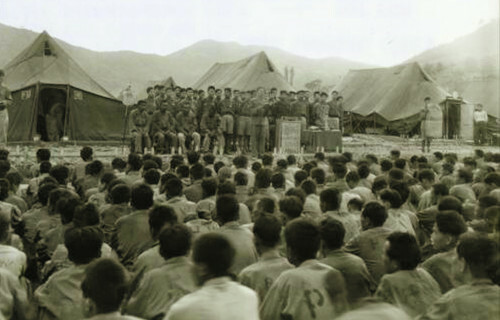 Harol Voelkel (Korean name: Ok Ho-yeol) holds a worship service together with communist soldiers at the war prisoners camp in Geoje-do, February 1951. 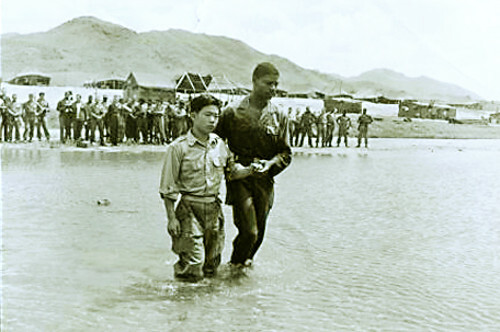 U.S. Navy chaplain Alexander Boyer baptizes a Korean worker employed at his base, in the winter of 1952. Posted 2015-06-23 16:39 on The Kukmin Daily website. (Reporter Kang Ju-hwa (rula@kmib.co.kr), with Yeara Ahn-Park (yap@kmib.co.kr). 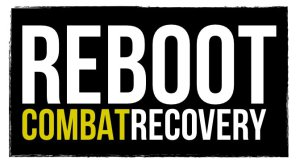 Photo courtesy of Institute for Military History). Original article in Korean.